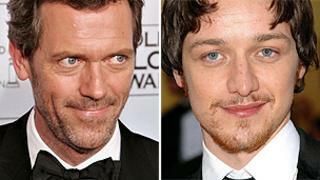 James McAvoy and Hugh Laurie have joined the voice cast for Arthur Christmas - the latest film from Aardman Animations. A host of other British stars have also signed up to the project including Jim Broadbent, Bill Nighy and Imelda Staunton. The film tells of Santa's ultra-high-tech present delivery operation hidden beneath the North Pole. It is expected to be released in November next year. McAvoy will voice Arthur, the clumsy younger son of Santa and the only one in his family still captivated by the magic of the holiday. Laurie will play Arthur's older brother Steve, the heir to the operation who has given the North Pole high-tech efficiency and military-style precision. Broadbent is set to voice Santa with Nighy as his cranky 136-year-old father, Grandsanta. Oscar-winning composer Michael Giacchino is writing the score, while League of Gentlemen producer Sarah Smith, who has also written the screenplay, will direct. "We are thrilled to have assembled such a phenomenal group of actors for Arthur Christmas," Smith said. "Not only are they all terrifically funny, charming and characterful but they have also brought an emotional subtlety and depth that gives the film great heart." Bristol-based Aardman's last cinematic release was 2006's Flushed Away, starring Hugh Jackman and Kate Winslet.